Catalog Page 54 - 14" Hanging Monkey Clingers have Velcro attached to the hands so the monkey can hang. We offe brown, white, blue and pink colors. We can also personalize each piece with the MLB (Major League baseball) logo of your choice. 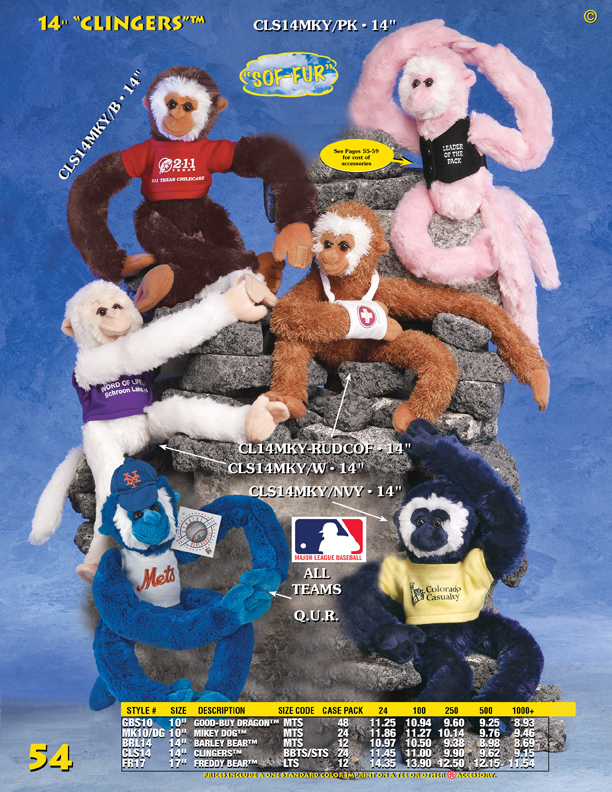 The stuffed hanging monkeys are popular gyms and sporting events. Pricing includes the one-color printed t-shirt. Our standard printing colors are red, white, blue and black. In addition to these monkeys with t-shirts, we also offer printed accessories including hats, scarves and ribbons. If you order more that 1,000 pieces, we can manufacture custom embroidered your teddy bear or stuffed animal, instead of using a T-Shirt. We have over 30 years of experience manufacturing stuffed animals. Send us your design today.